This link will take you to an outside site, Amazon. This link will take you to an outside site, Allport. We are multiple award winning artists Lyn Nance-Sasser and Stephen Sasser. Our prints have been exhibited in galleries and museums all over the world. 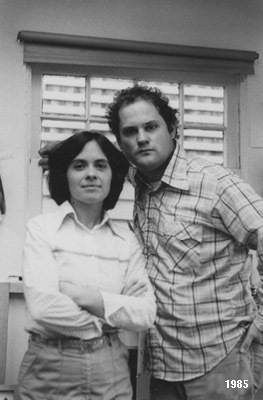 Both born in Portland, we have made the city our home and studio since the beginning. It was while we were in art school together that we discovered our love for graphic design, and to prove it, after graduating, we opened our own award-winning printmaking studio and atelier, working on our own prints and helping other artists translate their imagery into prints. After taking a hiatus to start a family, we came back to printmaking. And now we're creating numerous print suites featuring iconic images that inspire us. A series that has reached somewhat wide acclaim features attributes of cities from far and wide. The unusual urban images are superimposed on vintage tourist street maps, accompanied by a “YOU ARE HERE” graphic, pinpointing the precise location of each chosen icon. You can see them all on Amazon Handmade by clicking the button on the left of this page. The YOU ARE HERE prints focus on urban icons and vintage tourist street maps. We take photographs, with an iPhone, of several features for a specific city, and then create sketches based on the landmarks. Once we're happy with our work, we impost it onto a retro street map, so each print is as unique as the city which inspired it. You Are Here — Portland began with ten images of our home town, two each from the five city sectors. Then, after executing a successful Kickstarter campaign, we have expanded our geographic reach to include prints featuring icons in cities across North America. And we've begun a new series and completed prints featuring cities in Asia and Europe. “Our collaborative process is the foundation of our work. We have been working together on images for over 35 years."